I didn’t eat there yesterday but I did stop by Sweet Lou’s Waffles a couple of times to take photos and meet some of the staff during their first day of business. 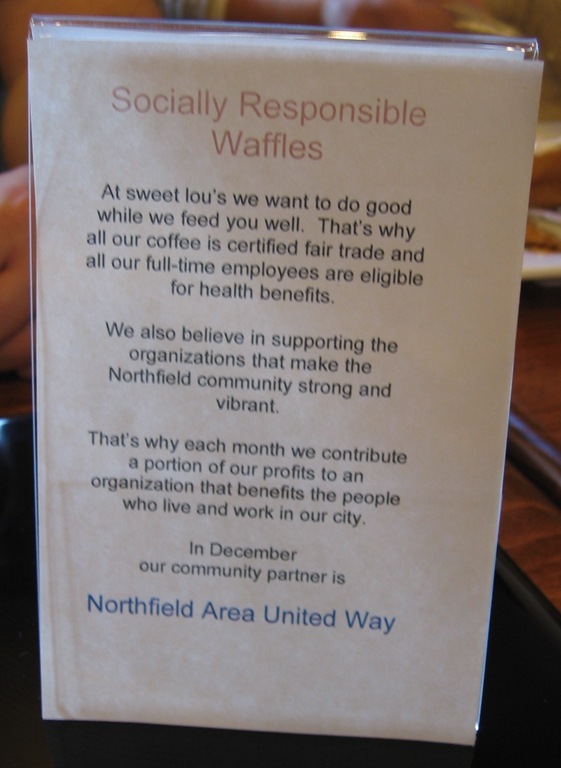 Left: They have ‘socially responsible waffles’ signs on the tables noting, among other things, that the Northfield Area United Way is their ‘community partner’ for December. 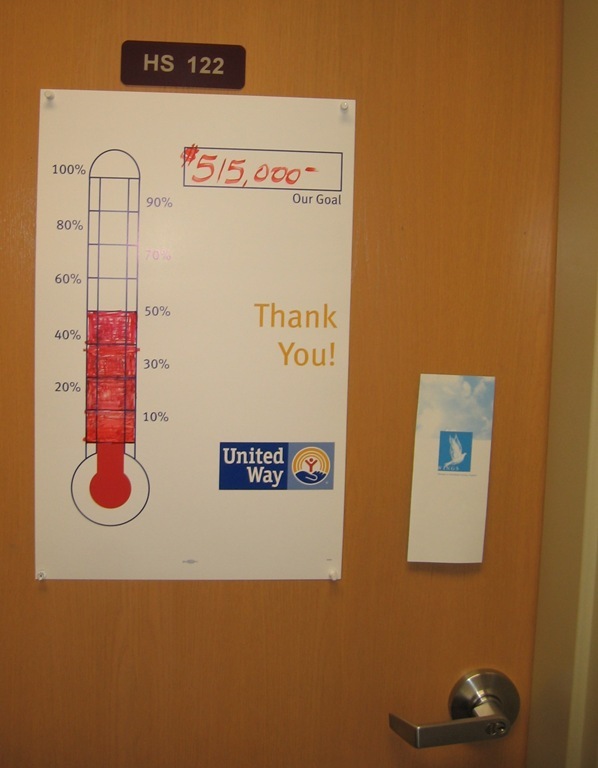 Center: When I voted at the NCRC building at lunchtime, I noticed that Executive Director Elizabeth Schott has a thermometer chart on her door for the current campaign, showing the campaign at 50% of the way towards the $515,000 goal. See her November 21 blog post for an update. And note on the right sidebar that you can Donate to the Northfield Area United Way via credit card. 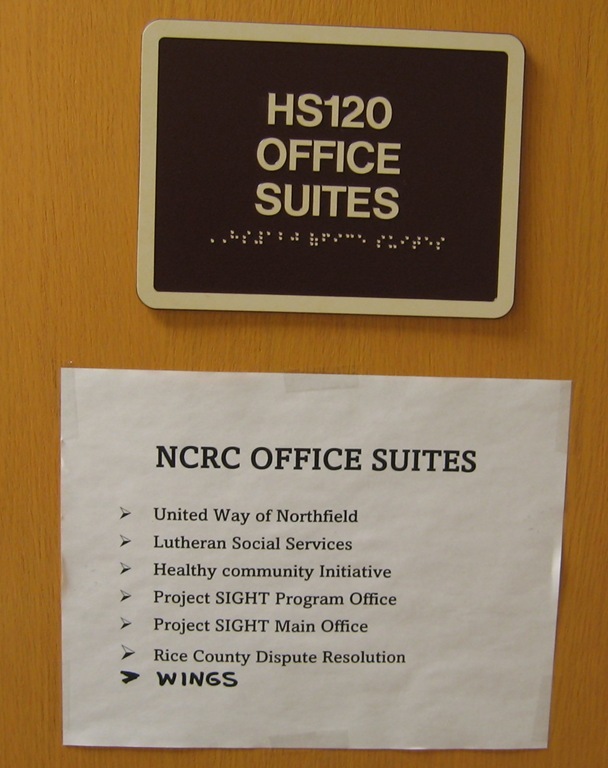 Right: other area non-profit organizations in the same suite of offices at the NCRC as the United Way. as we always ask more than anyone is prepared for, I will offer a couple of suggestions. and they should arrive at the table a few minutes before the waffles cool off, not after. Real maple syrup is not so dear where you have to lock it up all the time, is it? There is lots of machine noise, I would prefer musical ambiance. I do love the plush living room style center chairs, the electrical outlets, and the waffles were pretty good, too. What a disappointment! We were looking forward to our first visit to Sweet Lou’s with some other locals on Sun, Dec 23rd at 10:00 AM. We braved the cold and windy and snowy weather and arrived to find a darkened and locked up building. No signs or notices. The web site proclaims it is open from 7 AM to 2 AM. Thank God we have the venerable Tavern. This kind of retail strategy continues to confuse Northfield shoppers who want to shop locally but can never be sure when a retailer is open or not in Downtown Northfield. I agree Mr Deboer, how are we supposed to support local businesses if they don’t want to be supported? ; if you say you are going to open certain hours then do it. These kind of behavior from the owners does not speak really well of their commitment. Can they survive? will they?. I don’t know, at this point I don’t feel I want to go there any time soon. Yesterday they had a “No Waffles” sign posted but were selling pastries and coffee. Perhaps they have had a equipment malfunction or something. I am looking forward to waffles and wi-fi so I intend to give them the benefit of the doubt and visit when they are up and running. Sweet Lous had serious roof leak that the contactors needed to fix for them to be fully functional again. The concept & waffles are great and quite an addition to a small town. I appreciate everyone’s comments and constructive suggestions. I also appreciate the frustration of those who arrived recently to find that either the restaurant wasn’t open or was not able to serve waffles. There was a major water leakage problem in the kitchen, which forced the managers to move the waffle irons to avoid water damage. The building management is working to resolve this, but the problem arose on Saturday, and now the Christmas holiday will delay repairs for a few days. 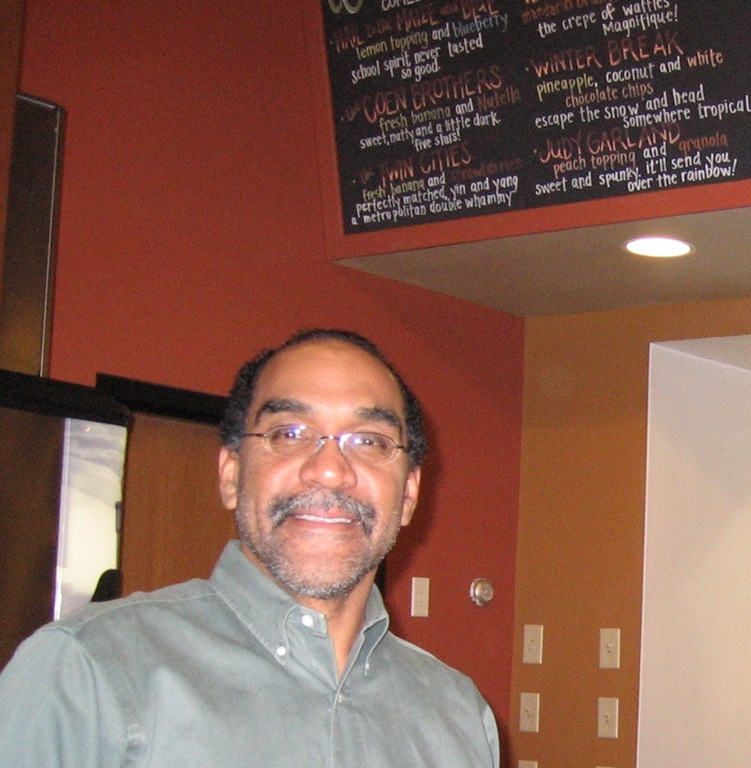 Rick Davis, the general manager of sweet lou’s, will be happy to provide a complimentary waffle and cup of coffee to anyone who was inconvenienced by the irregular hours in the last few days. The restaurant also closed early Sunday on account of the winter storm. We appreciate your business, and your patience as we get up and running. 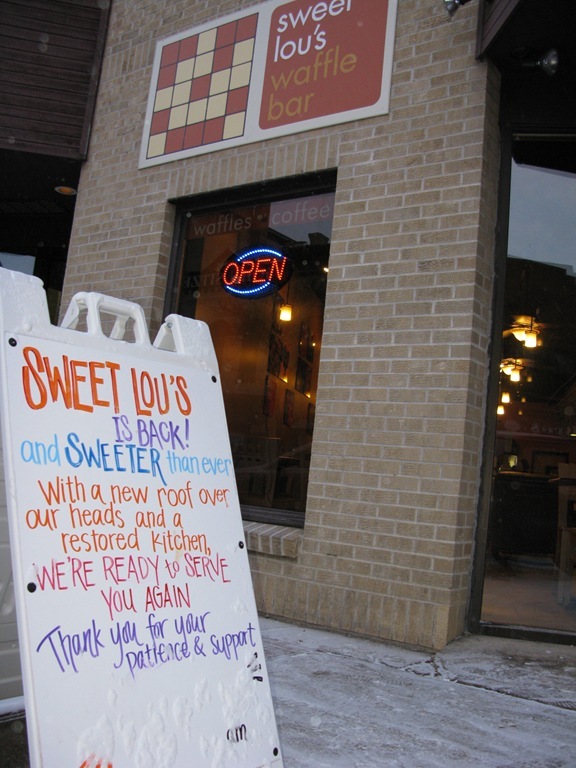 We sincerely hope that you will continue to patronize sweet lou’s. It is our intention to give all our customers excellent food, outstanding ambience, and friendly, efficient service. Well, it’s Christmas Eve and we had my husband’s daughter and boyfriend here for a visit. She’s a talent agent in L.A. and he’s a rock musician, so they’re world travelers, California restaurant regulars and pretty fussy. They loved Lou’s. Loved the waffles, loved the lattes, loved the atmosphere. Huge thumbs up. Only one tiny, tiny thing…charging for maple syrup in a waffle shop just seems wrong. It’s not that the price was high, it’s just a perception thing, like charging for a coffee refill. Excellent syrup should just be part of the package. Like I said, it’s a small thing. Good luck with the place! It is obvious that Sweet Lou’s has been a greatly anticipated addition to downtown Northfield. Starting (and following through with) a venture like this is exciting, expensive, daunting & frustrating. I want to thank Lewis Neuman and all who worked with him to get it up and running. I am looking forward to my first visit. So sorry to hear about the water problem! My husband and I enjoyed waffles at Sweet Lou’s Monday morning. 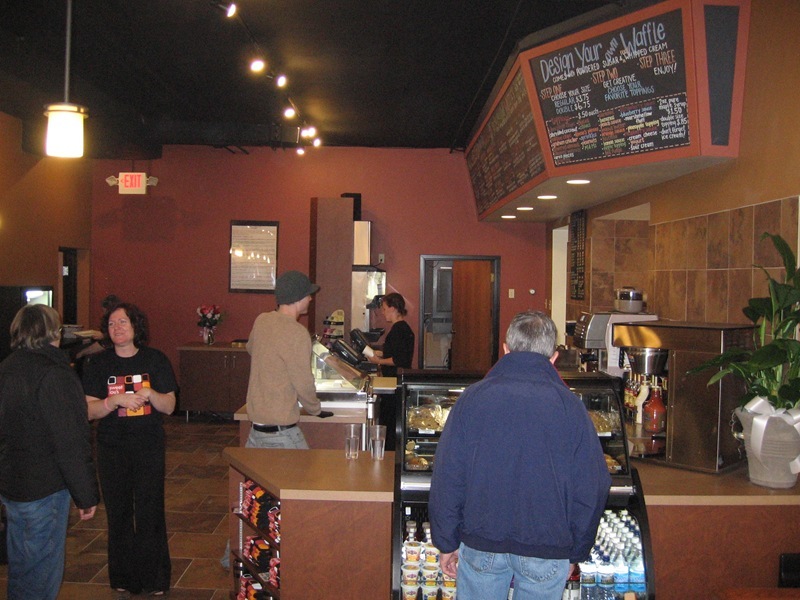 Great food, hot coffee, friendly employees and a cozy atmosphere. I’ll be back to try new waffles; the strawberry banana was wonderful! We ate at Sweet Lou’s today for the first time. It was delightful! The Coen Brothers, Garrison Keillor and Twin Cities were all good. Sweet Lou’s has been closed this week, evidently due to a water leak of some kind from the apartments above. Anyone have details? Griff, I called a couple of days ago and was told they have a bad roof leak in the kitchen. They were not sure when they would reopen. 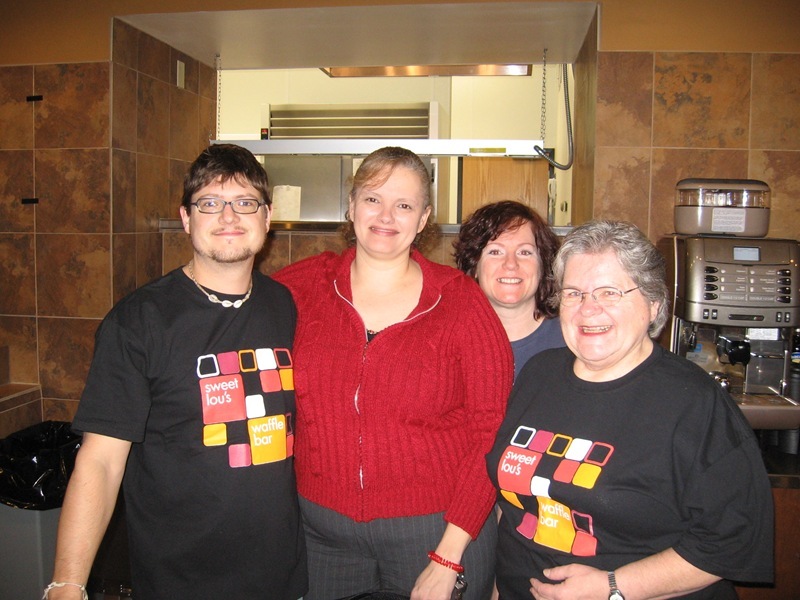 This week’s Nfld News: Sweet Lou’s closes temporarily. Jeesh. I wonder if they had business interruption insurance. I wonder who’s responsible for the leak. I wonder what’s happened to all the employees they hired and trained. They also had a now hiring ad in the classifieds. Sweet Lou’s reopened on Sunday. 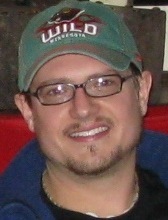 Matthew Bunch, pictured on the right, is the new manager. I met friends at Sweet Lou’s on Sunday and it was packed! I was very impressed with how fast our waffles were ready after we ordered them. Everyone was working really hard. Great job! They have a fantastic variety of sweet and savory waffles. I can’t wait to have strawberries and bananas with whipped cream, of course! My daughters were visiting earlier this week and we tried out Sweet Lou’s. Good grub was the verdict, even from their slightly foodie perspective. We especially liked the hummus/tomato/olive and salmon/sour cream/cucumber versions, and the banana-Nutella dessert waffle. The stuff-on-a-waffle idea may seem weird at first blush, but it makes good sense, as the whole wheat waffles are good in their own right, and their shape and texture support piling a lot of good stuff on. Every culture seems to have the same basic idea: pizza, chapati and dosai from India, injera from Ethiopia, etc. The space is inviting and the service friendly, too … I’ll be back.